Here Comes The Flood - a weblog about music: Living Hour: "Miss Emerald Green" single, two tracks on "Family Portrait pt. II"
Living Hour: "Miss Emerald Green" single, two tracks on "Family Portrait pt. 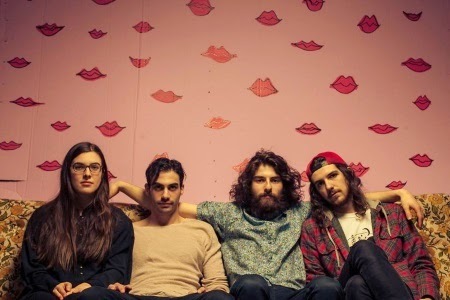 II"
Canadian dream pop/shoegaze Living Hour, formerly known as The Hours, have a new single. Miss Emerald Green is a laid back, pastoral song drenched in echo. Chill out music with a rather impressive psych lead guitar. Miss Emerald Green is a self-released single. Buy it (pay-what-you-want) from their website. They have contributed to tracks (Steady Glazed Eyes and Summer Smog) to the forhcoming release Family Portrait pt. II, a four way split between Living Hour, Bruising, Fruit Bomb and Abattoir Blues on Art is Hard Records (April 27th on black/white marble effect 12″).